Details: 1 BR, 2 BA Residence with approx. 875 sq. 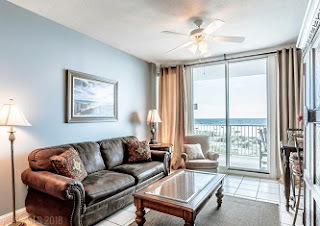 ft.
Lighthouse condo for sale in Gulf Shores. This beachfront condominium is a 1 bedroom + bunk room (features adult-size bunks + place to hang clothes, and store luggage, all built-in) with two bathrooms. Floor-to-ceiling windows: living room & master bedroom both offer breath-taking views of beaches & gulf waves! Over sized beachfront balcony with brand-new furniture:multiple seating/relaxing options while you sip coffee, or your favorite beverage as the dolphins play and pelicans glide by overhead. The living room features a tall bistro-style table for waterfront dining, as well as a full-size sofa - with queen sofa sleeper! New HDTV, DVD player and stereo finish-out living room. Kitchen features granite counters, with newer stainless refrigerator, stove microwave, pantry & all the essentials. Excellent rental income, all new paint in 2017. Perhaps the best part, just a short walk down the beach to dining and shopping!